A trust for minors is the same as a trust for adults with the sole exception that the testator--the person creating the trust--must appoint a custodian to manage the finances in the trust until the child becomes an adult. You may include provisions in the trust that limit how the custodian may use the funds, and even limit the ability of the child to withdraw the trust's funds when he becomes an adult. Trusts are complex, and you should enlist the aid of an experienced estate planning attorney to assist you. Select a custodian. The custodian will manage the funds in the trust for the child until he becomes an adult. While the custodian will be subject to reporting requirements of the probate court that manages your estate, you should only choose someone you trust. In addition, many financial institutions have professional custodians who can manage the trust for a fee. Transfer the funds or other assets you wish to be part of the trust. The account will be named "In Trust for [name of minor child]." Your financial institution will be able to take care of this step for you. Draft a trust document that specifically identifies the minor child, the custodian you wish to appoint, a backup custodian in the event that the first is unwilling or unable to perform her duties, and the amount and location of the funds to be included in the trust. Consult an estate planning attorney if you need assistance with this step. Outline any provisions if you wish to restrict the use of the trust funds. For instance, some testators will specify that the trust may only be used to tend to the basic health, safety and welfare needs of the child until he is an adult. You may also specify that the trust may be used only for educational expenses. Typically, a trust contains a provision explaining that the trust will dissolve, and directing that all assets be distributed to the child when he reaches a certain age, usually 25. 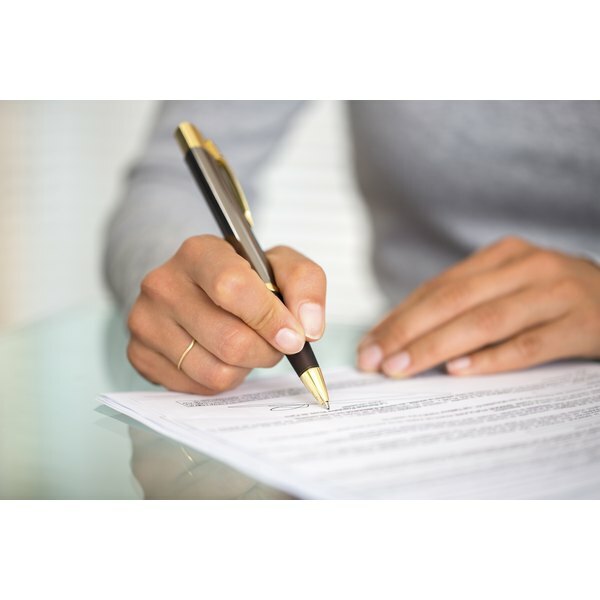 Sign and date the trust document following all laws and regulations required by your jurisdiction. For instance, some states require that the trust document's signing be witnessed by no fewer than two disinterested parties--individuals who are not named in the trust document. If you fail to follow these formalities, the stipulations you expressed in the trust may not be carried out. Provide a copy of the trust document to the custodian, backup custodian, child or his parent or guardian, and the financial institution who manages the trust. Leave personal items out of the trust. Typically, only income-producing assets such as stocks, bonds or funds held in an interest-generating bank account should be included in a minor trust. Do not rely on general information about minor trusts as legal advice when constructing your own trust. Only an attorney licensed in your jurisdiction is qualified to provide legal advice.